3 X 5 FT Pirate Flag is appropriate for indoor or outdoor use. The pirate flag has its origins set back to the plain black flag that was flown on-board a pirate ship to warn a merchant to surrender at once. 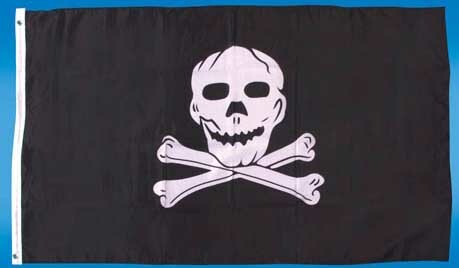 These black pirate flags were often further embellished with the graphics of death and destruction to further remind that failure to do so would result in certain death. Our Pirate flag depicting the "Jolly Roger" (skull and crossbones) is certainly the most famous of all Pirate flags in history. It is believed to be the flying pirate flag of Edward England and Edward Teach, history's most recognizable and infamous pirate of them all... Blackbeard.